The estate is nestled on a hill in front of the picturesque medieval village of Allerona, surrounded with round hills and gullies of Umbria, Lazio and Tuscany, where culture and traditions seem to merge harmoniously, creating a unique atmosphere of tranquility, warmth, premium wine and food. The farm is easily accessible. 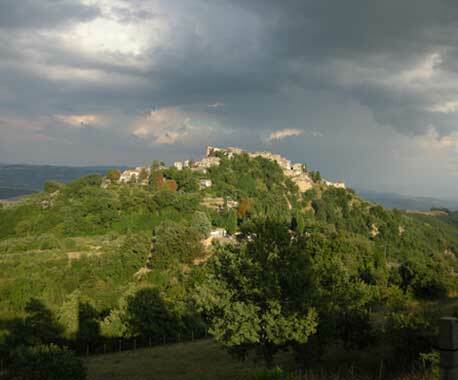 - Coming from Rome we suggest you to take the A1 motorway to Orvieto (direction Florence). At the Orvieto exit, turn right towards Orvieto. Follow the pointer to Allerona. In fifteen minutes you'll be close to the village where you will find signs of the farm that will bring you to Selvella. - Coming from Florence we recommend that you follow the motorway A1 (direction Rome) until Fabro. At the Fabro exit, turn right and follow the signs to Allerona. In 30 minutes, after crossing the park of Villalba, you will be near the village of Allerona. Just before reaching the village you will see on the left the signs of Selvella. Follow them and you will get to the farm.